In some cases, we are able to diagnose and treat problems with blood vessels in a single procedure. The vascular experts at Premier Vein & Vascular provide the following diagnostic and interventional procedures right in our offices for your convenience. An angiogram is a minimally invasive imaging procedure used to look at the inside of arteries. In our office, we perform angiograms on the extremities (arms and legs). During an angiogram, a catheter is guided through the artery until it reaches the target area. It releases a contrast dye and X-rays are taken, depicting blood flow within the blood vessel. Angiogram is considered the gold standard for evaluating blockages in the arteries. Not just a diagnostic procedure, an angiogram can be therapeutic as well. Two common therapies provided during the procedure are a balloon angioplasty and stent placement. Commonly performed during an angiogram, balloon angioplasty and stent placement are used to open narrowed or blocked arteries. While the catheter is in location at the target artery, a balloon is introduced and inflated to widen the artery walls. After the balloon is deflated, X-ray images are taken to assess the result. If blood flow is not sufficiently improved, a stent is then put in place via the catheter to keep the artery walls propped open. Like a balloon angioplasty and stent placement, an atherectomy is a method of treating blockages in blood vessels without surgery. In this case, a catheter enters the blocked artery and scrapes the plaque buildup (atherosclerosis) off vessel walls using a tiny bladed tool. Like angioplasty and stenting, an atherectomy is often used to treat peripheral artery disease (PAD). Similar to an angiogram, a fistulogram is an X-ray imaging procedure that uses contrast dye to evaluate blood flow within the AV access in a patient undergoing dialysis. If narrowing (stenosis) or blockages (occlusion) are noted in the AV access during a fistulogram, an angioplasty with or without stenting may be performed. Blood clots are a common cause of blockage within an AV access fistula or graft. Declotting procedures are those that treat blood clots that form in the AV access fistula, graft, or catheter of dialysis patients. In this procedure, an in vena cava (IVC) filter is placed in the large vein that carries blood to the heart from the lower body (the inferior vena cava) to protect patients from a pulmonary embolism if they are unable to take medicinal anticoagulants. An IVC filter prevents clots from traveling to the lungs in patients who are at high risk after surgery or trauma, or in patients who suffer from deep vein thrombosis. Using image guidance, our vascular surgeon will place a catheter into a blood vessel through an incision in the leg, arm, or neck, and insert a tiny filter into the inferior vena cava to trap any potential blood clots. A thrombectomy is a surgical procedure to remove a blood clot from inside an artery or vein in order to prevent a pulmonary embolism (when the blood clot travels to the lungs and becomes a life-threatening situation) and restore proper blood flow, especially in people prone to deep vein thrombosis. It is done if the use of clot-dissolving drugs proved unsuccessful, and it may include balloon angioplasty and stenting. A thrombectomy is considered a life-saving procedure. A venogram is an X-ray of the veins taken after contrast dye is injected (because veins cannot typically be seen in an X-ray). 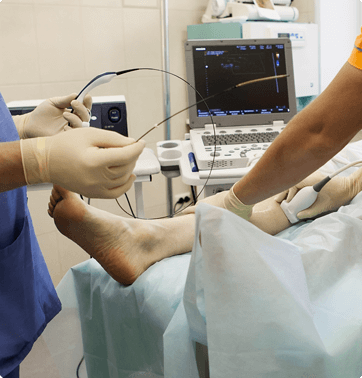 A venogram reveals how blood is flowing through the veins – especially the veins of the legs – and to look for blood clots or other reasons for restricted blood flow. If you’ve got a vascular or cardiac issue, the experts at Premier Vein & Vascular have an interventional solution for you. Call 1-888-VEINCARE today or use our online form to request an appointment and find out how we can help you at either of two convenient Florida locations in Tampa and Largo.